I have two boys. They do not play with dolls, action figures are an other story. 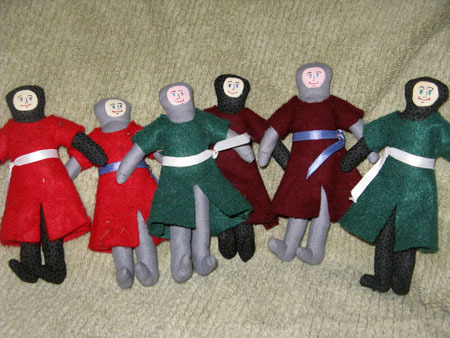 When my boys were younger (pre-Kindergarten) I made them a bunch of cloth action figures. 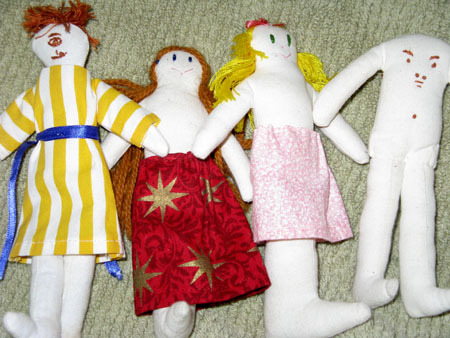 They are made from a simple paperdoll pattern for the top, then the legs are inserted and heavily stuffed. I got tired of sewing the dolls and taught the embroidery machine to sew the pattern. Unfortunately I could never figure out how to turn those skinny legs on a machine. The blue action figure is a pict, note the tattoos and lack of clothing. Naked dolls are always a hit with children. We had a green army and a red army. The white belts indicate that action figure is a Knight. Action figures also have enemies. These were made from a Bestiary. They were played with more by the children of the Barony, and not my children. That is why they are still clean. Even though my boys no longer play with dolls/action figures I have kept them in my event toy box, other children still enjoy them. Some toys are not used they way you had intended. 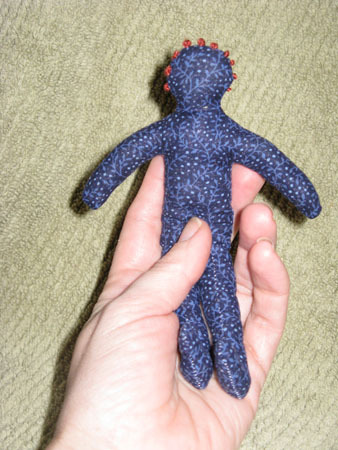 This poor doll has a wooden body and was a frequent teething target. 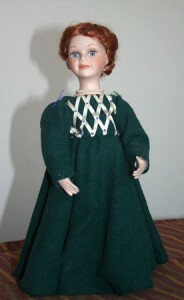 This doll now lives at a friends home. She is safe from my boy. 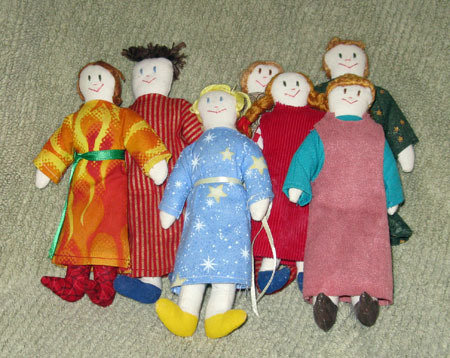 The next family of dolls not only comes with documentation, but it has a wonderful story. The doll on the left hand side of the picture was an early A&S project. 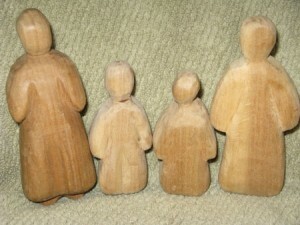 I worked very hard on him, I learned to carve and finish with a child safe material (olive oil.) I tested him out with my son, his head was the right size to be teethed on. 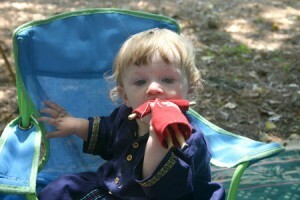 We took him to many events, including Pennsic until one fateful day to the merchants. He feel out of the stroller. I went back and looked everywhere. I was heart broken, but toys are meant to be used and he was lost. I think it was about that time that I made the rest of his family. Two years later when I was shopping I looked up and saw him in a wool merchants booth. He had been lost for two years and the merchant had brought him to each Pennsic figuring that at some point they would find his owner. I wrote a Thank you note and included his documentation, so they would know he had gone home with the correct family.